The Planned Parenthood sticker on sophomore Kate Murray's laptop. GREENWICH — A controversy over a Planned Parenthood sticker at Sacred Heart Greenwich has drawn sharp reaction in the community and divided the school from many of its alumnae. Bishop Frank Caggiano of the Roman Catholic Diocese of Bridgeport stood by Sacred Heart’s decision to tell a student she cannot return to the school next year if keeps the sticker on her laptop. The all-girls Catholic school in northwest Greenwich is not a diocesan school. However, the diocese confirmed that Caggiano spoke to Hayes before she gave her decision to sophomore Kate Murray Tuesday. 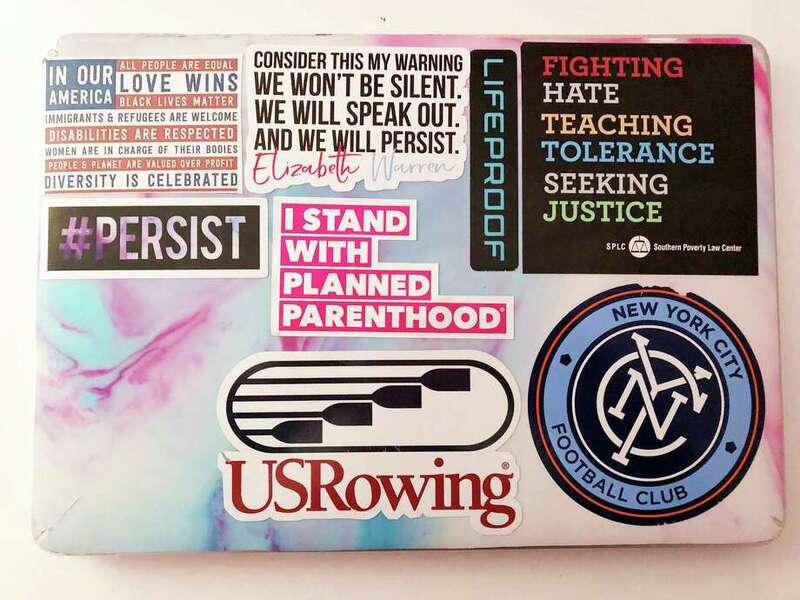 The sticker states “I stand with Planned Parenthood” and is one of many on Murray’s laptop. As of Friday, Murray had not made a public decision about whether she will finish the school year or her high school education at Sacred Heart Greenwich. Her parents, Brian and Tracy Murray, did not respond to requests for comment Friday. The diocese was not the only organization connected to the controversy to weigh in this week. Planned Parenthood has said it stands with Murray. President and CEO of Planned Parenthood for Southern New England Amanda Skinner attended Newton Country Day School in Newton, Massachusetts, an all-girls Catholic school that is part of the Sacred Heart Network, of which Sacred Heart Greenwich is a member. Skinner was baptized Catholic, she said, and attended her Catholic school for four years, before graduating in 1988. Both Planned Parenthood and the Catholic Church share values of community service, she said. On Thursday, Planned Parenthood Federation of America President Cecile Richards tweeted her encouragement to Kate. Planned Parenthood of Southern New England has 17 health centers in Connecticut — three in Fairfield County — and serves nearly 65,000 patients a year. The organization said 90 percent of its services are preventive health services, including routine gynecological care, breast and cervical cancer screenings, birth control and pregnancy testing and STD/STI testing and treatment. It also provides abortion services. The sticker dispute has sparked debate online, where Kate Murray has gained strong support from many Sacred Heart Greenwich alumnae and others. The petition was started by Stephanie Viola, a close friend of the Murray family who graduated from Sacred Heart Greenwich in 2012. Other online commenters have supported the school’s decision, saying Sacred Heart, as a private insititution, can set restrictions on student expression and behavior on its grounds. Moreover, some wrote Murray could choose not to attend if she does not agree with the school’s decision. Julie Byrne, a professor of Catholic Studies at Hofstra University who has written about the Church and reproductive rights in her book “The Other Catholics: Remaking America’s Largest Religion,” said the debate over the sticker exemplifies the divide between the Church’s policies on abortion and artificial contraception and many American Catholics, who have loosened their views on these issues. To the Church, abortion and artificial contraception threaten foundational beliefs that God is the one who should determine life and death. Surveys combined by the Pew Research Center from 2011 through 2013 showed 53 percent of white Catholics said abortion should be legal in all or most cases, while 41 percent said it should be illegal in all or most cases. Among Hispanic Catholics, 43 percent said it should be legal in all or most cases, while 42 percent said it should be illegal in all or most cases. According to a Pew Research Center 2015 survey, roughly half of U.S. Catholics say using contraceptives is not a sin.